I am happy to share that Spicy Treats Crossed 25 Lakhs Hits and 600+ posts, Thanks a ton to all my readers, visitors and my blogger friends. Without all your constant support and encouragement i couldn't reach this. I thank each and everyone who visit my space regularly from My Bottom of my Heart. Special thanks to my Blogger friends who never fail to encourage my work by sharing their lovely comments. Thank you dear friends and hope you will extend your support in the future coming days also. All my centuries post were a special post with lovely Desserts/Sweets. But right I am not in a celebration mood due to some personal issues. But hope we get back to normal soon and will share a delicious dessert for this occasion soon. Now-a-days i could not visit all your space regularly, so sorry for that and please don't mistake me. I love blog hop but because of personal issues and commitments couldn't do it regularly, i know everyone is having their own personal issues and commitments but still you people are great never fail to visit mine, thanks a ton. I feel so guilty and hope i can spend some time in coming days and definitely check all your wonderful creations. Thanks again! 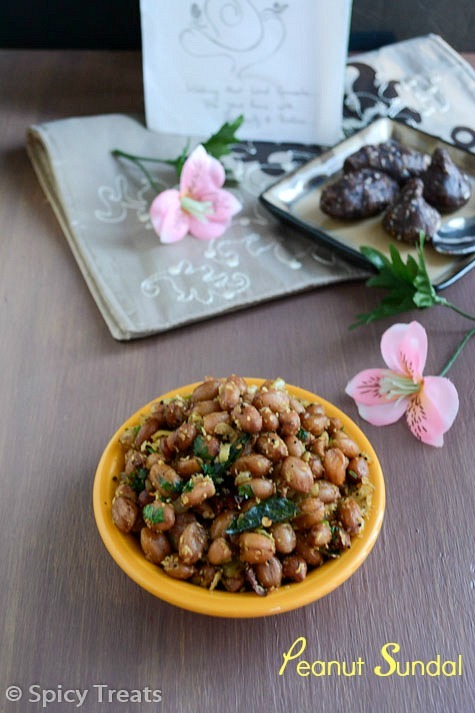 Now Coming to the recipe, Sundals is one of the must Nivedyam for Vinayagar Chaturthi Pooja and Navarathri. Sundals are easy to make stir fry with boiled legumes & lentils. You can use any desired legumes and lentils. 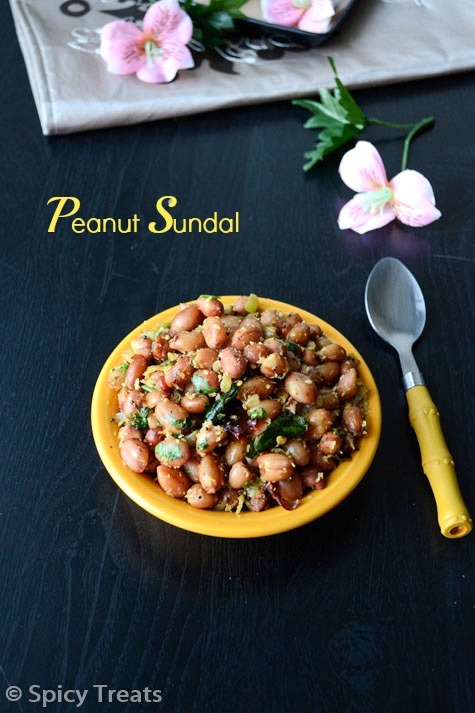 Today am sharing Peanut Sundal. I love boiled peanuts with fresh peanuts. Comfort and healthy munch while watching TV and playing games, but we couldn't find fresh peanuts all the time. But still you can make boiled with dry raw peanuts. Just soak it and use, its so simple and very tasty sundal. Soak Peanuts with enough water for minimum 2-3 hours. After that drain that water and pressure cook with water 2-3 cups of water and enough salt for 1 or 2 whistles or cook in sauce pan until soft and tender. ( this method will prevent mushy or over cooked peanuts, i follow this method). Once done drain excess water and allow to cool for a while. Heat oil in a pan, when its get heated add mustard seeds allow to pop then add chana dal and fry till golden brown. After that add finely chopped onions, dry red chilli, curry leaves, hing and saute for a minute. Then add cooked peanuts, turmeric powder and stir fry for a minute. And add shredded coconuts and stir fry and finally add finely chopped cilantro, mix well and switch off the stove. That's it...Tasty Peanut Sundal ready. 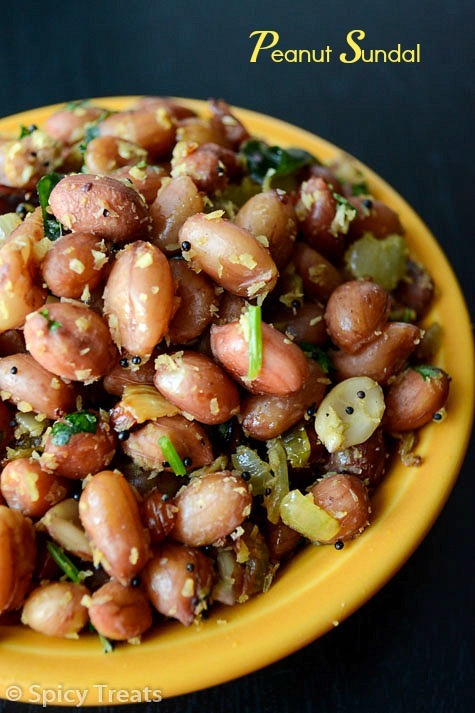 Adding onion is optional, i like to add onions to my peanut sundal but for pooja or nivedyam onions is avoided. 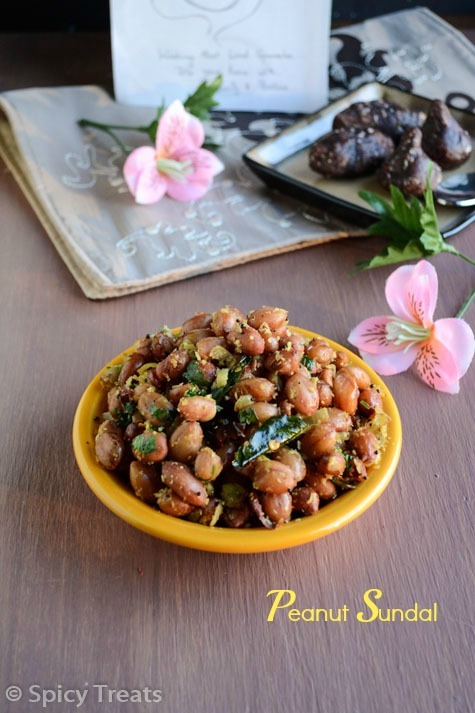 The same way you can also make Chickpeas Sundal, Peas Sundal, Beans Sundal except you need to soak it over night or 6 hrs. Congrats and thats a wonderful milestone Sangee, keep on rocking..Wish you many more beautiful moments like this. Sundal looks fabulous. 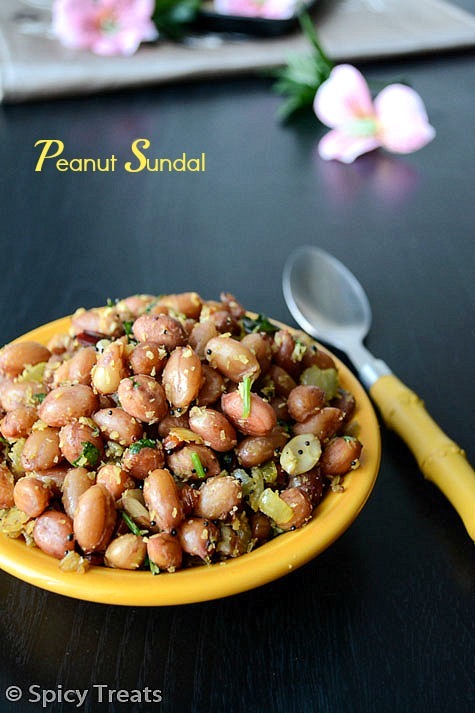 Crunchy and super delicious sundal. Yummy! Congrats on your milestone dear & wish u many more to come.. Hope all ur worries ward off soon :) And lovely clicks & a healthy breezy sundal !